Caption slip reads: "Photographer: Brunk. Date: 1953-09-14. Reporter: Simmons. Assignment: Adoption, Dept 21 (? ), City Hall. 43-44: 15 families adopting children thru Holy Name Adoption Society. 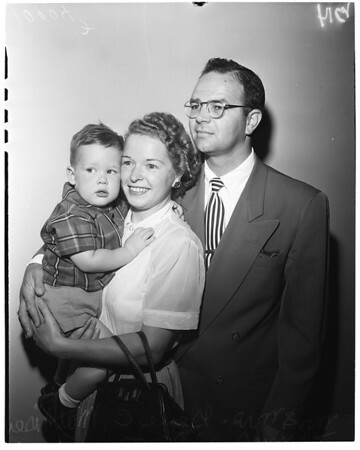 13-14: Mr. & Mrs. Gene C. Mathisen, 17616 Delano St., Encino & adopted son, Jimmy, 17 mos."